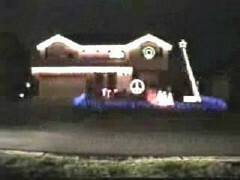 Remember the Christmas light house that made the rounds on the internet synchronized to light up in time with the music of the Trans Siberian Orchestra? Miller used the home in a Lite Beer commercial. Well the creator of the home has taken it to the next step, and if you live near Cincinnati, Ohio you will have the opportunity to see the next generation of the show. The creator, Carson Williams, is creating a much larger display and will have it available for viewing, albeit at a price. The new show, at the Heritage Oaks Park will cost 15 dollars per car, but will have over 25,000 lights and 12 minutes of music. He would have kept doing the show at his home, but the traffic was so bad it was a danger to the community and he was forced to find a neutral location.